The Russian Defense Ministry has slammed a recent Human Rights Watch report that calls the alleged October 26 bombing of a school in Syria’s Idlib province a possible “war crime,” stating it is nothing more than another information attack. 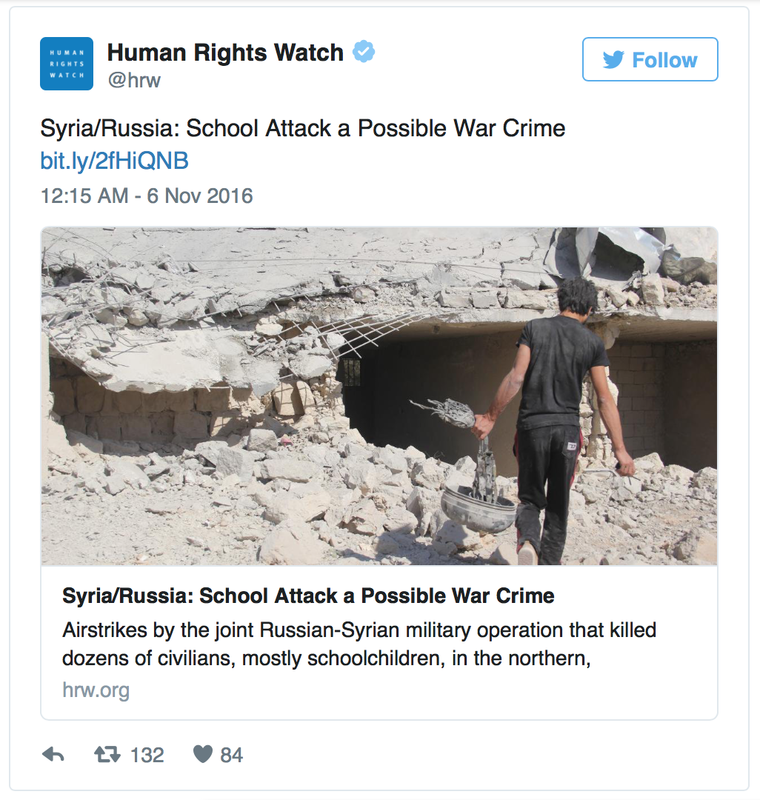 The HRW report in question, published on Sunday, November 6, assumes without question or hard evidence that the attack on the school in Idlib province, which it claimed “could constitute a war crime,” had been carried out by “the joint Russian-Syrian military,” merely citing ‘witness accounts’ it apparently got over the telephone. “The repeated striking of a large school complex in a residential area indicate the attacks were unlawful, being either indiscriminate or deliberately targeting civilians. Serious violations of international humanitarian law (the laws of war), when committed with criminal intent, amount to war crimes,” the report from HRW reads. The Russian Defense Ministry, however, denounced the report. Initial reports on the attack on the school in the village of Al-Hasa in Idlib province, where some 28 civilians are said to have been killed, came from the controversial London-based Syrian Observatory for Human Rights and opposition activists from the Western-funded Civil Defense Network, also known as the White Helmets, who published pictures of the aftermath of an alleged attack and were quick to pin the blame on either Russian or Syrian warplanes. 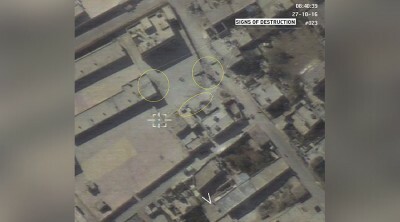 However, the Russian Defense Ministry dispatched a drone to analyze the site of the alleged bombing on the same day and found no evidence of airstrikes. “The Ministry of Defense already published comprehensive and absolute drone-filmed photographic facts on October 27, which showed the absence of any traces of bombing at the school complex in Al-Hasa,” the statement from the ministry noted. Konashenkov also said earlier that the ministry had analyzed the photo and video ‘evidence’ from the supposed attack, which had been presented by the White Helmets and published in a range of Western media outlets, and found it to consist of “more than 10 different shots, filmed at different times of the day and in different resolutions, that were edited into a single clip.” Overall, the Russian Defense Ministry said the alleged evidence did not amount to proof that the school had suffered from an airstrike, while noting that no Russian Air Force planes had even been in the vicinity of the school on the morning of the supposed attack. For some time now, Idlib province has been under the control of the Army of Conquest, an anti-government alliance of rebel groups run by Al-Qaeda’s affiliate in Syria, the Al-Nusra terror group, which has recently rebranded by renaming itself Jabhat Fateh al-Sham Front. The Russian Defense Ministry pointed out that, given these circumstances, it is “foolish” to think that secular schools are still operating in the area, and therefore doubted that there were, in fact, any children in the vicinity of the school complex at the time of the incident. “I would like to remind the so-called ‘human rights defenders’ from the ‘Human Rights Watch’ that the province of Idlib, including the settlement of Al-Hasa, has been under the full control of Al-Nusra terrorists for over a year… Moreover, there has not yet been any even indirect evidence that children were, in fact, present there at all, not only in those buildings, but in Al-Hasa village in general. Therefore, one has to be an explicit liar or a madman to say that secular schools built by [President Bashar] Assad’s government are continuing to operate on territory controlled by the Syrian branch of ‘Al-Qaeda’ and under constant battle action,” the Defense Ministry statement read. Russian military officials say the attack on the Idlib school had been deliberately made to look like an airstrike. 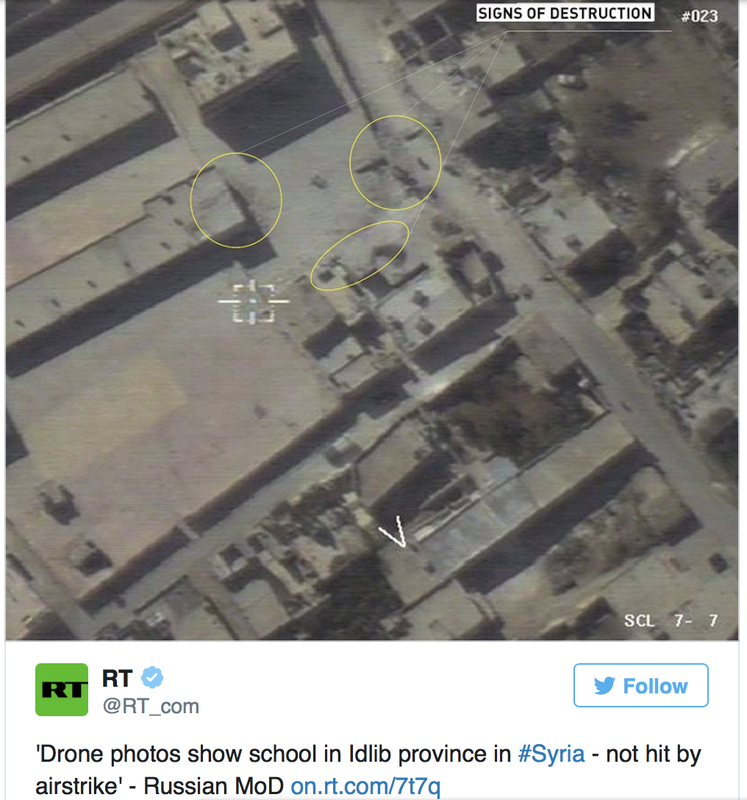 They also identified several schools in Syria that actually have been targeted, but by rebel fire. One such attack, which militants carried out on a school in government-controlled western Aleppo, claimed the lives of at least six children.